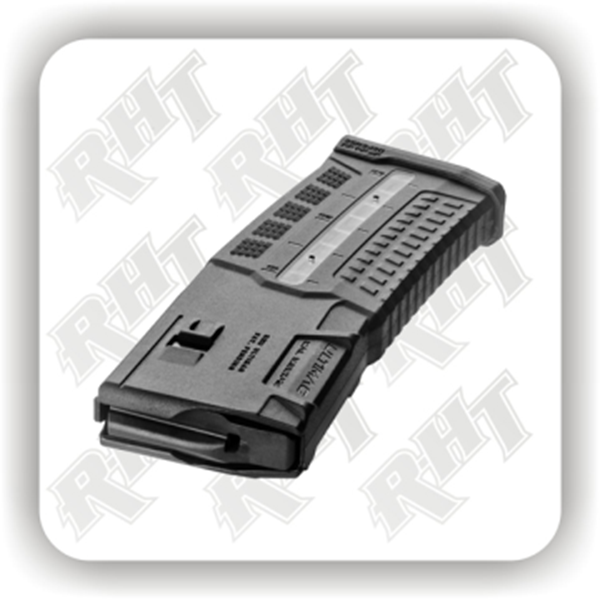 The Ultimag 30R provides a strong, durable, and reliable magazine solution using high grade materials. Multi-textured surface for enhanced grip when handling and reloading. Unique floor plate for versatile coupling options. Disassembled by hand, no tools needed. Long-lasting cataphoresis-coated stainless steel spring for ideal corrosion protection. Hybrid AK style spring design prevents tilt. Unique internal design for smoother, more reliable feeding. Low-friction follower for increased reliability. Durable, lightweight, impact and crush-resistant reinforced polymer construction. Translucent round-level windows on both sides combined with an indicative follower for rapid visual determination of remaining rounds from 10 to 30. Extended floorplate for improved magazine handling with gloves and gear. Compatible with double and triple mag pouches. Over-travel protection, stops on the follower for extended and accurate spring operation. Another quality Polymer Coupler for your Magazines. The TZ-2 is light-weight and maintains secure magazine operation. Whether it’s your accuracy or numerous target engagements you can depend on your last ten chances with FAB’S Survival Buttstock w/Built-in 10 round Mag Carrier.